Wonderful Holiday Season and a Happy New Year!!!! 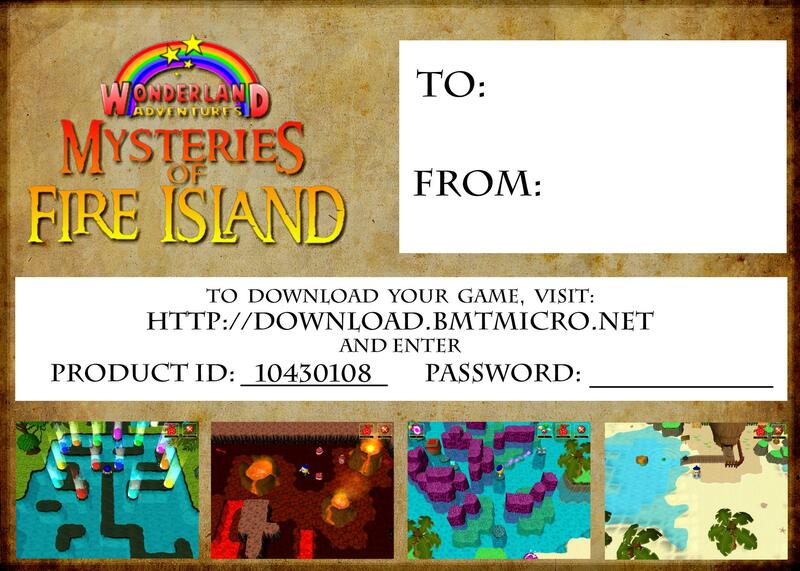 Several players asked if and how they could give our latest game - Wonderland Adventures: Mysteries of Fire Island as a gift. We think that's (of course) a great idea! 1. Order the Game as usual from our website. When you enter your information, enter the recipient's name under the line 'Licensed To:'. That way they will appear in our database. You will still receive the download and receipt e-mails as usual. 2. 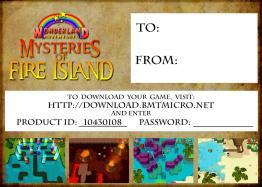 You can either forward the download e-mail to the intended recipient, or use a gift card for a personal touch. All you would need to tell them is the Product ID (#10430108) and the Password (from your download e-mail), and point them to http://download.bmtmicro.net. We have created a 5x7 (inch) gift card for you to use, you can download it as a PDF file by clicking here, or - if you prefer - you can download it as a 2100x1500 JPEG FILE. Once again, many happy wishes for the new year!!!! !